and his email to us reveals that this isn't such a good offer as we originally thought. There are two reasons why it isn't as good of deal. Firstly, the 50% discount is off of their high season value rates and most of the window of this promotion is during the saver season which means without the sale you would get up to 30% off anyways. - they are evoking a discount of 50% on a mileage table (high season) that, anyway, would have never applied to this period. So it is actually, a much lower saving what is being suggested and proposed than the 50% mentioned. 2) Technically there could be one small window within this promotion period in which, technically speaking, the high season table would apply (basically around Carnival time - where the High Season table would be valid for the specific period)...but guess what? Exactly that period is excluded from this 50% off promotion...incredible how they twisted this, right? On a very sad note, the mileage value 50'000 miles for return trip mentioned in your article and used as base for your calculations is not correct. All the values are one-way (with the promotion 50% ALREADY APPLIED). 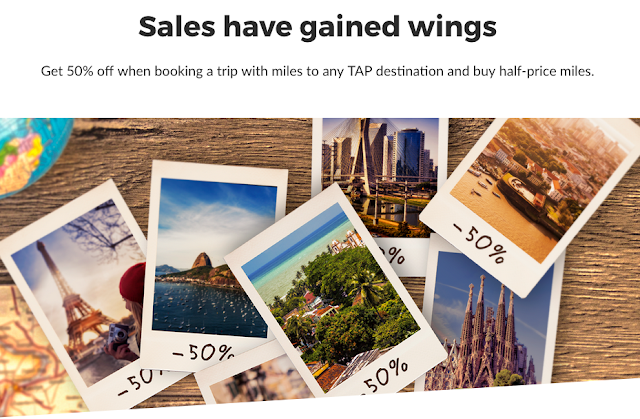 Without the promotion, TAP requires 200'000 miles on high season for a return Business Class ticket to North America. This was part of a very recent change that has caught everyone unnoticed and was under-advertised completely and masked away by a program name change from TAP Victoria to TAP Miles & Go. Unfortunately, FFP members community in Portugal is weak, unorganized and has no voice in the matter. FFP is also not a mass-consumption item in this market and so TAP gets by easily with such actions. So, this "promotion" comes just after the "standard values" were increased by over 100% - easy to come back now and say: I now have a 50% off promotion...right? So while last week it seemed like you could fly between Toronto and Portugal in economy class round trip for 26,000 miles and 50,000 miles for business class, it's actually double that. The discounted round trip rates are 52,000 miles for economy and 100,000 for business! Not so good of deal now! Thanks again to Pedro for bringing this to our attention.